1st China International General Aviation Expo, Chengdu, November 25th-27th 2016 (CIGAE). Italian Aerospace Network has proudly attended the 1st China International General Aviation Expo in Chengdu, Sichuan Province, from November 25th to 27th 2016. 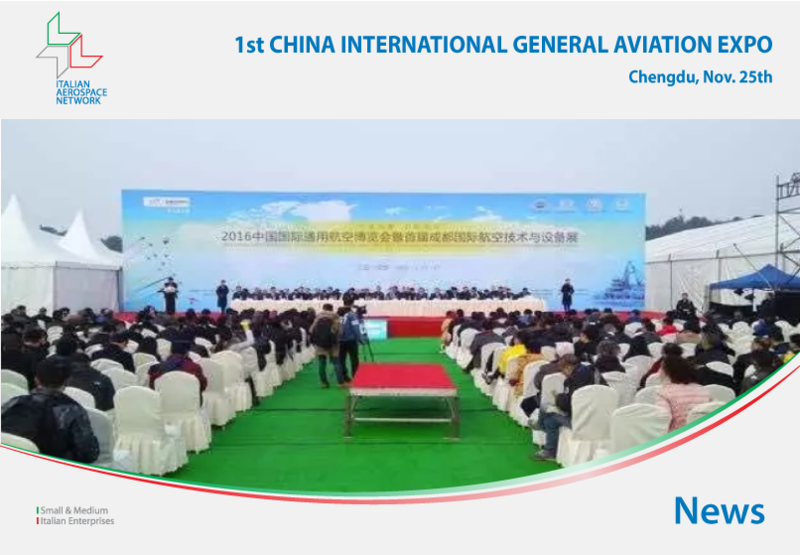 In order to support the Chinese Central Government plans for the development of the General Aviation Industry, the Sichuan People’s Government and Civil Aviation Authority of China have successfully organized the first International General Aviation Expo in Chengdu. With respect to the Sino-Italian Cooperation Program for the Aviation & Aerospace Program the Consulate General of Italy in Chongqing, represented by its Scientific Counsellor Mr. Lorenzo Gonzo, has attended the Opening Ceremony and delivered a speech to remark the positive institutional and commercial relationships that link Italy and China since the beginning of last century and the Italian continuous support in strengthening the trade between the two Countries. Over 300 exhibitors from all over the world have participated in the event and several static and dynamic air-shows have made the first edition a real success.